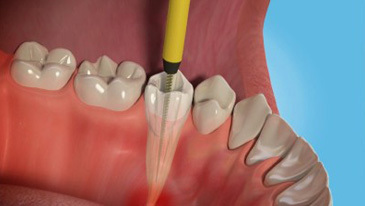 Root canal treatment is usually very successful, with an overall success rate of probably about 85%. However, if the infection comes back the treatment can be repeated, although with a reduced success rate. Can there be any problems after the treatment? As root treatment is complex and time consuming, demanding longer appointments, you may find that your jaws feel a little tired afterwards. Occasionally you may experience some pain after the treatment, due to the stirring up of the infection associated with the tooth. This usually only lasts for about 48 hours and a mild painkiller should be all that is necessary to ease any discomfort. Should symptoms be longer lasting then we would advise that you contact us. If you should experience such symptoms, the outcome of the treatment is not affected. Will the tooth need any further treatment? Yes. It is advisable to restore the tooth with a crown, which will provide additional strength to the tooth. This will avoid possible fractures and the root treatment is less likely to fail, so increasing the longevity of the tooth. Root canal treatment is a routine dental procedure, which can be carried out at the Mews dental clinic. If after assessment we feel that the treatment is likely to be complex, we may suggest that treatment by referral to a specialist may be more appropriate. Root-treated teeth should be treated just the same as any other tooth. Remember to clean your teeth at least twice a day, preferably with a fluoride toothpaste. Cut down on sugary snacks, and keep them only to mealtimes if possible. See your dentist for regular check-ups.